Good Show Sir’s Art Direction: OH NO! I forgot all about that bloody book cover… crap it’s due tomorrow. Oh man… WAIT… is your son still in that drama club? Great! We’ll head over, get some props, slap a wig on a skeleton and take a picture. It’s better than nothing… right? Nom, nom, nom…Boney just loves the taste of curly blonde hair in the morning. Warning: Smoking can seriously damage your health. Some people say the fashion for size zero models has gone to far, Not me! Last night, I dreamed I was shouted at by the saleslady at a book store because I was taking pictures of the bad sci-fi fantasy covers. I think that I spend too much time on this Web site. @DeadStuff – haha What were you shouting at her about? We might all spend to much time looking at covers. The problem is I buy them too. Such as the cover above! 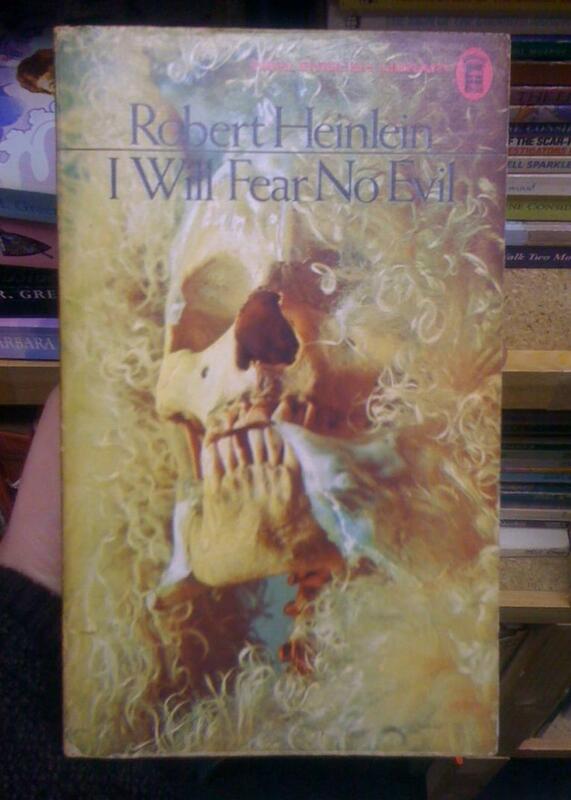 The guy in the second hand bookshop was so happy because he thought that he had found another Heinlein fan. I had to appologise and say I didn’t really like his books and I was just buying it for the cover. I think a part of him died that day. @SI, uhm… which part of him died, exactly? And does it play in a Big Hair band? At a quick glance I thought this was the cover to a romance novel. Typical blonde supermodel with a Michael Jackson nosejob, soft focus, tons of hair. Then I see Heinlein. Now I am intrigued. What could this be? Totalitarian necrophiliacs with severe oedipal issues forcing the huddled masses of masochistic coprophiliacs to engage in regressive reenactments of the origins of their paternalistic phallic fixations enforced on them by an omniscient government? Oh wait. That’s not romantic. And neither is this book. Good read, weird cover. 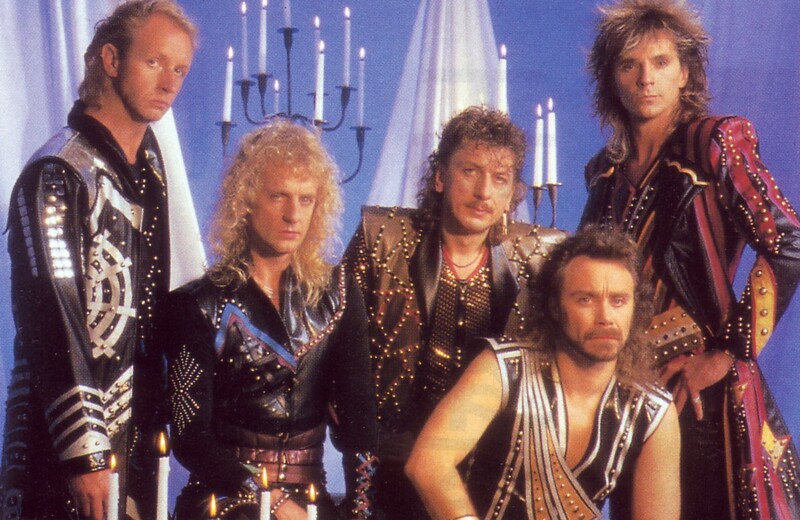 @Jaouad – He tore his Judas priest t-shirt right then and there! In fact… second person along… is that our skeleton!?! Please post a funny cover tomorrow. We promise to write better comments. I wonâ€™t hurry, I wonâ€™t rush. This is supposed to be a children’s tune, but it takes on an eerie, darker feel when sung while looking at the cover, don’t you think? Like one of Blake’s “Songs of Innocence” that reveal a terrifying subtext upon close scrutiny. I do expect all loyal GSSers to spend at least part of the day singing this tune while studying the cover. This will carry us until my man Bibliomancer’s injunction is heeded by admin. Robert Plant has really let himself go. This is one of the Heinleins I discovered after I’d been burned by The Cat Who Walks Through Walls. So I’ve never read it. But after brushing up on the plot outline, I was reminded of that wacky funster Dmitry Itskov and his merry plans to put his brain inside one of Masamune Shirow’s cyborgs. In Heinlein’s book, Smith’s new body begins to weaken, age and decay; cyborgs would have their own problems, but not identical ones. I wonder if this cover actually subverts Heinlein’s speculations: if there are mechanical parts much easier to service and replace that give just as much satisfaction of immortality as biological ones, why bother? So what happened to the young secretary’s brain? Phwoar, look at the vertebrae on him, etc.